Chancellor George Osborne, who owns a 15% stake in his family’s business Osborne & Little Group Ltd, ‘personally benefited’ from the sale of £6m worth of property to a company based in the British Virgin Islands – a well-known tax haven. 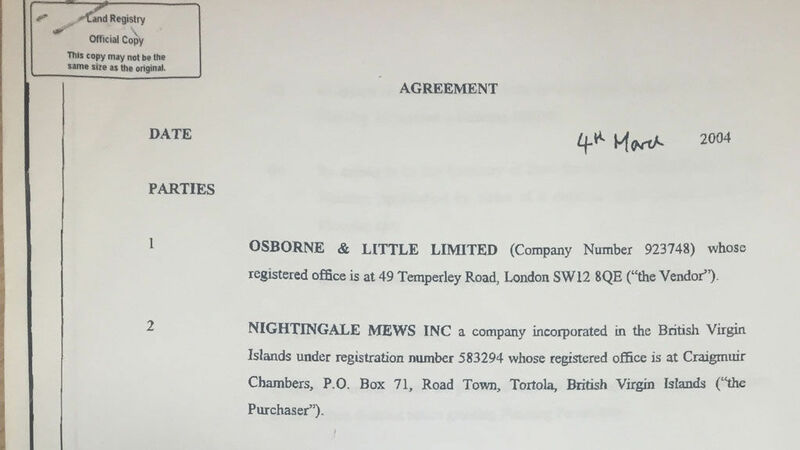 First reported following an investigation by Channel 4 News in 2015, Osborne & Little Ltd teamed up with a company called Nightingale Mews Inc. to redevelop the site of its former headquarters. Both companies jointly applied for planning permission, and once they were given the green light, Osborne & Little sold their site to the offshore firm for £6,088,000. At this point in time in 2005, the soon-to-be Chancellor of the Exchequer was the beneficiary of a trust that owned at least a 15% stake in the family-run business, and so George Osborne would have ‘personally benefited’ from a chunk of this £6m windfall. However, it is not known exactly how much Mr Osborne personally received from the sale. He added that by basing itself in the British Virgin Islands, Nightingale Mews Inc would have avoided any tax on profits it made. Land registry records shows that after the redevelopment, Nightingale Mews Inc. sold the property for around £20m, with an estimated profit of £8m. By being based in a tax haven, the company avoided paying £2m in UK corporation tax. Immediately following the sale of the property, Nightingale Mews Inc was dissolved, leaving no trace of any individuals involved in the deal. With the Panama Papers scandal bringing the shady dealings of secretive offshore companies into the mainstream media, the resurfacing of this story will be a further embarrassment to a Chancellor who today terminated an interview when asked about his involvement with offshore companies. George Osborne has also previously advocated ways of avoiding paying inheritance tax on The Daily Politics show, and it seems he is well versed on ways of skirting around the laws he is now tasked with implementing. Osborne & Little have previously come under fire for paying not a single penny in corporation tax for seven years, despite paying out dividends worth £335,000 to shareholders in 2014. Payments that include a sum of £1,230 directly to George Osborne himself. In 2012, George Osborne himself stated that tax avoidance is ‘morally repugnant’. We can only remain independent through subscriptions and one-off donations from our readers – money that helps keep our writers producing truly independent journalism, free from establishment bias or agenda.